I’ll apologize right now for the poor state of my writing… need to get back in practice. 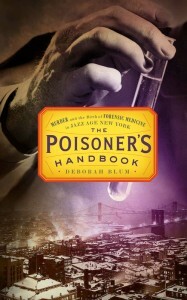 A fascinating Jazz Age tale of chemistry and detection, poison and murder. The Poisoner’s Handbook is a page-turning account of a forgotten era. In early-twentieth-century New York, poisons offered an easy path to the perfect crime. Science had no place in the Tammany Hall-controlled coroner’s office, and corruption ran rampant… Medical examiner Charles Norris and toxicologist Alexander Gettler set the justice system on fire with the their trailblazing scientific detective work, triumphing over seemingly unbeatable odds to become the pioneers of forensic chemistry and the gatekeepers of justice. However, the most memorable thing is the variety of poisons, most still readily available, and the fear instilled in me that anyone or their mother could poison me at anytime. The Jake Walk: also know as jake foot, jake leg, jakeitis, jakeralysis, and gingerfoot (I like gingerfoot). A loss of control over the muscles that enable the pointing of the toes upward. Victims raise their feet high with the toes flopping downward, which touch the pavement first followed by the heels. The toe first, heel second pattern makes a distinctive “tap-click, tap-click” sound. This muscular paralysis is caused by a neurotoxic organophosphate (a plasticizer plus denatured alcohol) added to Jamaincan Ginger, or Ginger Jake. Carboxyhemoglobin “is bright, cherry red. It is a stable complex of carbon monoxide and hemoglobin that forms in red blood cells when carbon monoxide is inhaled… Hemoglobin binds to carbon monoxide preferentially compared to oxygen (approximately 240:1).” Apparently, this is how a lot of poisons or poisonous materials work: they are metabolized or used by your body similarly to something else that your body needs (eg. 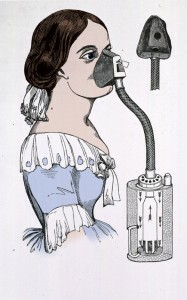 radium mimics calcium causing bone degradation instead of maintenance).